First 75 registrants get a $10 discount! Join us for a weekend course studying 40 Hadith Qudsi, beautiful meanings from Allah relayed to us by the Messenger ﷺ, through the classical text and hadith collection Mishkat al-Anwar by the great scholar Muhyidin Ibn 'Arabi. The intensive weekend course with Shaykh Samer al-Nass contains ~13 hours of content, commentary, and Q&A sessions, interspersed with poetry of love for the Prophet ﷺ. The original title of this book by the great scholar Muhyidin Ibn 'Arabi is: “The Niche of Lights: concerning some of the communications that have been transmitted from God." The “lights” are the Divine Sayings which appear in the “niche” of the Prophet ﷺ, who is the purest manifestation of the glory and beauty of these lights. A hadith is like a light whose flame has been passed from one lamp to another through generations, a living scripture kindled from the “niche-light” of our Messenger and Leigelord, Muhammad ﷺ. ​These communications or Sacred Sayings are incredibly rich in meaning. Recurring themes in the collection include our complete dependence on God, His immense Mercy and closeness to His Creation, and His readiness to forgive and embrace those who truly turn to Him. They are poignant and memorable statements of the Divine that bring us closer to Him, the Real. ​The Divine Sayings in the Mishkat Al-Anwar are called Hadith Qudsi or “sacred sayings”, these are meanings from God that are then reported by the Prophet Muhammad ﷺ, and reported outside the Quranic revelation. Of the several collections of hadith made by the celebrated thirteenth-century master, Ibn 'Arabi, this is the most popular. The Mishkat is the only book in the vast body of Ibn 'Arabi’s writings that is specifically dedicated to Hadith Qudsi. This is not only a collection by a person well-versed in the science of hadith literature, but a selection by a true spiritual master. Many scholars consider Ibn 'Arabi’s Mishkat Al-Anwar is the second oldest collection of Hadith Qudsi. As the Mishkat Al-Anwar is one of the earliest collections of its kind, it played an influential role in making this particular sort of hadith collection more popular. This collection is unusual in that it is not just drawn from the books of tradition, but also contains one section of forty hadith qudsi with a full isnad for each, which begins from the people who transmitted the hadith to Ibn 'Arabi. Born in Murcia in southern Spain (the Andalus of the Arabs) in 1165 (AH 560), Muhyidin Ibn 'Arabi began his study of hadith in Seville at about the age of fifteen. Soon afterwards, he came into contact with several spiritual teachers in Andalusia, and rapidly displayed his exceptional gifts. Ibn 'Arabi left Spain to make the pilgrimage at the age of thirty-five. He arrived in Mecca in 1202 (AH 598) where he spent the next two and a half years. Acknowledged as a profound writer on spiritual matters and a teaching master in his own right, Ibn 'Arabi continued to study Hadith whenever he could throughout his life, eager to gain knowledge wherever it presented itself. It was during the middle part of his life, the two and a half years spent in Mecca, that he composed the Mishkat Al-Anwar and at least four other major works. For the last eighteen years of his life, from 1223 to 1240 (AH 620–38), Ibn 'Arabi wrote and taught prolifically. He attracted hundreds of students, drawn from all walks of religious and spiritual life. ​He spent his remaining years in Damascus where he completed many of his famous works. He died at the age of seventy-five, and was buried in the Damascus, just north of the city walls. It is quite clear from any investigation of his works that he cultivated a thorough knowledge of the whole Islamic tradition, and he was known during his lifetime as a reliable transmitter of Hadith. Indeed, Ibn 'Arabi is known throughout the Islamic world simply as Al-Shaykh Al-Akbar, “the greatest Shaykh”. Author of several hundred works, covering the whole vast range of Hadith literature to Islamic mysticism and spiritual thought, he has exerted an unparalleled influence on generations of Muslims. Many of these later students have become beacons of wisdom in their own right. WHAT IS A HADITH QUDSI? ​Hadith Qudsi (translated as Divine or Sacred Sayings) are a special kind of hadith: reporting a communication by God Himself to the Prophet Muhammad ﷺ, who thus assumed the role of transmitter. On occasion, such hadith are addressed by God to another prophet, such as Abraham, Moses or David, or to the angels, and reported by the Prophet Muhammad ﷺ. There are also several which God specifically and directly addresses the “children of Adam” or people in the next world. Although both Quran and Hadith Qudsi are from God Himself, there are important distinctions to be made between them. For example, the Quran was revealed through the medium of Gabriel, and is inimitable; a Hadith Qudsi does not necessarily come through Gabriel, but may be revealed through inspiration or a dream. While a muslim must recite portions of the Quran during the prescribed prayers, it is not permitted to recite Hadith Qudsi. An important difference also arises in the way each has been preserved and transmitted. While some hadith were memorized and indeed may have been written down during the life of Prophet Muhammad ﷺ, this process was less systematic and organized than in the case of the Quranic revelation. ​Online Registration is required and there is limited capacity to the amount of students to ensure the intimate & interactive nature of the class. Class timings are Friday from Maghreb (8:30) - Isha (10:00), Saturday 10:00 AM - 6:00 PM, and Sunday 10:00 AM - 6:00 PM. Free coffee and tea are provided. Islamic Foundation is graciously subsidizing this event to the Chicago-land community, make sure you take advantage of this great opportunity. No one will be turned away for lack of funds. 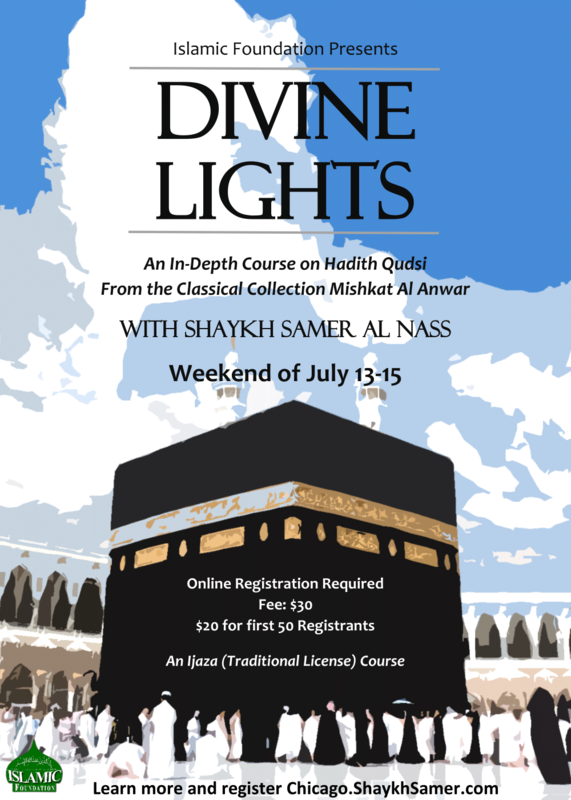 ​Join Shaykh Samer al-Nass on an incredible weekend as we explore these meanings from Allah All-Mighty. ​For important information on the course please visit our "Details" tab or click here. Email Support@shaykhsamer.com with any questions. Students who attend the entirety of the program will receive a signed formal Ijaza (traditional license) from Shaykh Samer al-Nass with a sanad (chain of transmission) going through scholars for generations back to Shaykh Ibn 'Arabi and ultimately to the Prophet Muhammad ﷺ. Click here to read more about the role of Ijaza in Islam and see an example. Shaykh Samer al-Nass of Damascus, Syria, is one of the foremost Islamic Scholars of our time with a wide mastery of subjects including the four schools of thought in Islamic Jurisprudence (Fiqh) and the 10 modes of recitation of the Holy Quran. He is also well known for his tremendous love and knowledge of the Prophet ﷺ. Check the full bio or the official website for more information.